For CES this year I wanted to try to bring less. Having to lug around all that stuff each day just wears you down. Though, at the same time you want to make sure you have "everything" you need to cover an event. There is a fine balance between keeping your and carrying just enough. Working from the floor of the Las Vegas Convention Center won't be as comfortable as working from the comforts of the office, but we will manage just fine. Nothing has changed much this year with the computer I'm brining. I'll be taking the MacBook Pro Retina again to CES. There are times where I wish I had the lighter MacBook Air, but I chose to go with additional power and greater capacity and really we're only talking an extra pound or so in weight. It handles everything you can possibly think of. The MacBook Pro is a perfect balance of portability and enough power to edit videos without any noticeable lag. I'll likely have my iPad alongside me while I work. I'll probably have it open up to some TechnoBuffalo site stats whilst working on my MacBook Pro. I'm going to miss my office display but I'll have to manage. However, I'll actively use the iPad in the mornings and evenings to check my email and maybe catch up on a few shows after work, if I'm not dead tired from each day's events. This year's TechnoBuffalo smartphone of the year is the Moto X. I have been using it regularly now and I cant seem to put it down. It is by far the most convenient Android device I've ever used. One downfall of this phone though is its camera. I'll carry this guy around as my backup phone. I actually haven't given this phone a try and just no it to be the Galaxy S4's smaller cousin. Like I mentioned above, I wanted to try and carry less this year. We'll see how it goes. I will also likely use this to post pictures to our Instagram account. I picked up these headphones online on Black Friday. I really wanted a cheap pair of headphones for events just like CES. Decent, yet inexpensive enough where I won't worry about thrashing them. They are super comfortable and do a great job. I've used this backpack for a couple of years now and its been very useful, its got enough room for just about everything and it has traveled with me through many events. It has enough padding to keep my shoulders and back comfortable, and plenty of pockets and compartments to fill it with whatever you need. I'll be taking the Apple Magic Mouse that I use daily at my desk. I know plenty of you will complain about its shortcomings. I find it perfectly fine for my daily use. I'm taking the Canon 60D images and if necessary video. I purchased this particular camera this Cyber Monday for my wife. I'll be borrowing it for CES. We actually use the Canon 60D in the office for photos and occasionally some video. Jon Quach turned me on to Grid-it last year. This thing is magic! 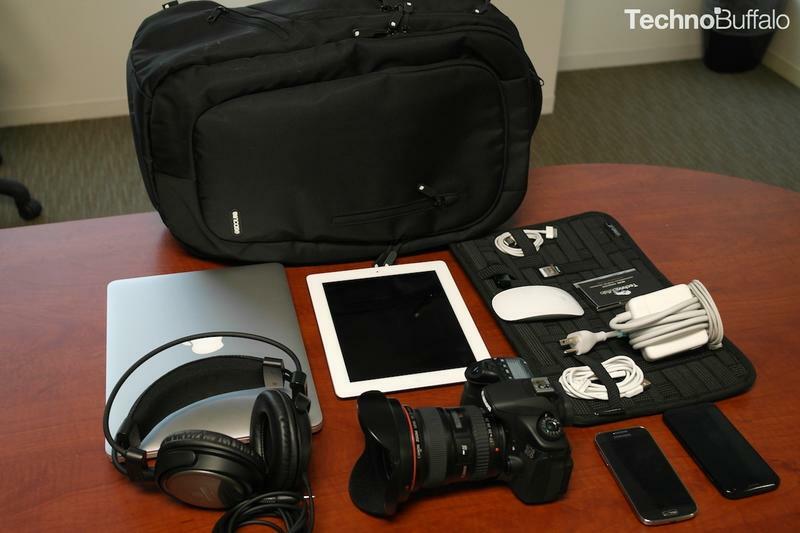 It keeps cords and other items that usually float around in your bag neat and tidy.